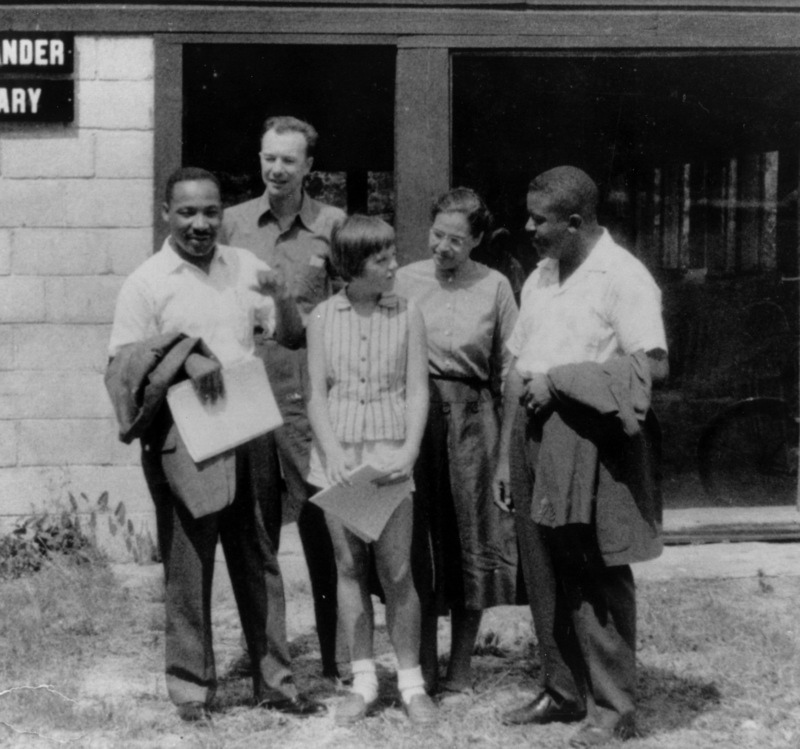 (from left) Martin Luther King Jr., Pete Seeger, Charis Horton, Rosa Parks, and Ralph Abernathy, in 1957. Earlier this year, on January 27, acclaimed folk singer and activist Pete Seeger passed away at the age of ninety-four. Seeger had a long and distinguished career, beginning in the 1930s when he was just a teenager. He was instrumental in the movement to re-popularize folk music in the 1950s and 1960s; was blacklisted for his leftist political ideals and was indicted for contempt of congress for his refusal to answer questions from bullying House Un-American Activities Committee in 1955; and was an early champion of the music of Bob Dylan. Later, in the late 1960s and 1970s, he used his music to protest the Vietnam War, and lent his talents to many other causes. He performed at the 2009 inaugural concert for President Barack Obama, and continued writing and performing tirelessly up until the end of his life. But one of the things Seeger is most known for is the song “We Shall Overcome,” the unofficial anthem of the Civil Rights Movement. Seeger didn’t write “We Shall Overcome.” Like many folk songs, it was pieced together from several sources and passed from musician to musician, each adding their own unique element to it, though it was mostly derived from a 1901 gospel song called “I’ll Overcome Someday.” By the time Seeger began performing the song, it had become “We Will Overcome.” Seeger changed the key lyric slightly, “We will” became “We shall,” as he felt that the revised phrase had a powerful, open sound when sung. He also wrote several new verses for the song. Seeger’s version of the song was performed by many folk singers, and quickly became popular amongst activists fighting for civil rights and laborers’ rights*. Seeger played the song at a 1957 performance: Martin Luther King Jr. was in the audience. Though King was familiar with the song, he was particularly struck by Seeger’s version. “We Shall Overcome” was just one of the many little things Seeger contributed during his lifetime, and it played a part in changing the world. To learn more about the 1963 March on Washington and the people who bravely stood together singing “We Shall Overcome,” please check out our acclaimed book, Martin Luther King Jr. and the 1963 March on Washington by David Aretha (ISBN# 978-159935372-2) from your local library, or purchase it from Morgan Reynolds Publishing. For further reading, please see the rest of our Civil Rights Movement series. *In addition to its association with the American Civil Rights Movement, “We Shall Overcome” has been an anthem for many oppressed peoples fighting for civil rights. It became particularly significant in South Africa, where it was sung by freedom fighter Frederick John Harris, prior to his execution for a bombing in protest of the country’s apartheid policy. A recorded version of the song, performed by Seeger, but with the last line, “We shall all be free,” sung by Harris was suppressed by the government, but became important to the anti-apartheid movement.